The Falcon eXplore is developed to offer a step in between youth cats and a competition platform as the Falcon F16, while keeping costs down. 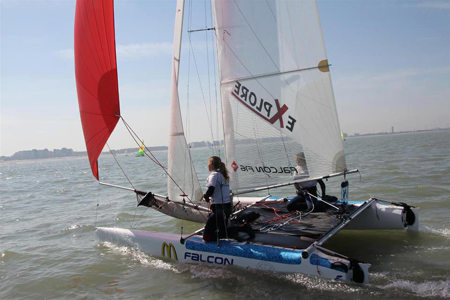 The Falcon eXplore is optimised for youth teams of 90 to 115 kg. The mainsail and spinnaker are smaller in size to reduce the muscle power needed and to ensure that the lighter team is comfortable on the boat at all times. Once the youth team reaches the ideal weight Falcon F16 (115 to 155 kg), just swith your mainsail en spinnaker and you have a fully optimised Falcon F16! Ideal for parents as they don't need to invest in 2 different platforms for their kids! For more details on the options available on the Falcon eXplore, refer to the Falcon F16 product page.